Any arm balance pose can be intimidating at first, and Parsva Bakasana or Side Crow pose is no exception. This pose enhances arm strength, tones your belly, and offers you a sense of balance and confidence. This pose is not something many can twist into without practice. So if you're just starting to learn the pose, it helps if you break it down into steps, as well as focusing on certain areas of the body. By bringing awareness to these stepping stones, you will then find your take off into Side Crow - after lots of practice - turbulence-free. I, like many, sometimes find this pose disheartening as you feel your body shake and quiver. But I find the poses you struggle with the most are the ones you need in each practice. This pose is to focus on and strengthen your core. It gives you no choice but to work those abdominals to prepare for flight. Hold as long as you can while maintaining proper alignment and breath. Bring your focus to pelvic neutrality in relation to the spine and heart center. When straightening legs, press out from the balls of your feet and spread the toes. It is also fun to add this twist: while in Boat, take hands clasped together in front and rotate them left and right to get the sides fired up and ready! Plank is a key transition pose, and when done right, has ample benefits that lead to success in more challenging poses. 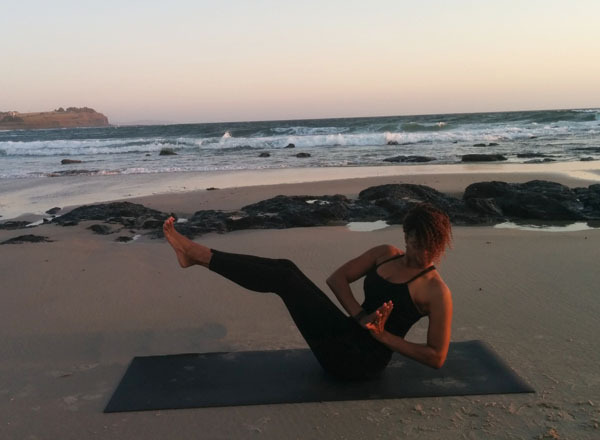 We again focus on the core, but in this pose we also get the benefits of also engaging and strengthening the arms and legs, which are all needed for Side Crow. When in plank, zip up your core and lengthen from the crown of your head through your heels. Open up at your collarbone while drawing shoulder blades back and down. Focusing on grounding through hands and feet with spread fingers and toes. Be mindful that your hips are lifted, creating a straight line of energy from crown to toes. To take this pose further, you can also lift one leg up while spreading toes and holding while transitioning into Chaturanga. This is the perfect stretch to warm up and help open your hips, which will help when twisting into side crow. 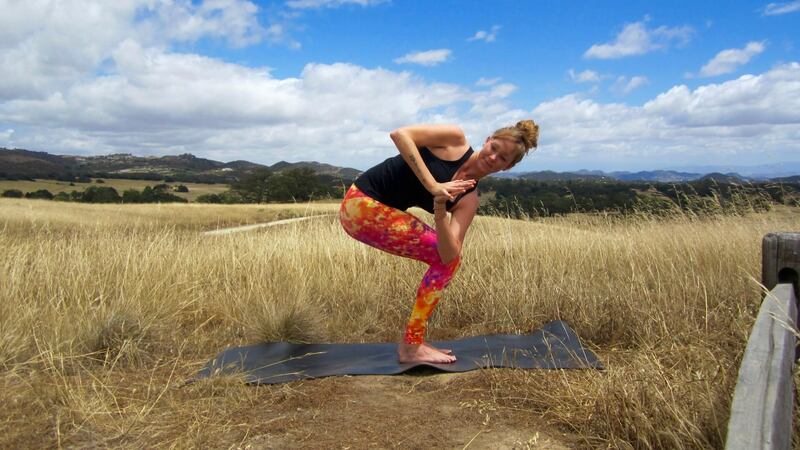 In this pose, you should have your hips squared to the front of your mat. You want to be able to feel that hip open, letting go of tension with each breath. Be mindful that your back leg is in a complete line all the way to your foot. Lengthen the spine, find your edge in the pose, and take deep breaths. To take this pose further, you can bring yours hands into prayer and twist so one elbow is on the ground and the other is toward the sky. This pose may seem simple, but it does more than get the body ready for a twist. It helps our mind and body understand balance and grounding. Start in Mountain pose and focus on rooting through our feet. Once you feel ready, bend into the knees to go into Chair pose. Bring your thighs as close to parallel as possible to the floor and draw your belly in while bringing shoulders back. Making sure your torso is leaning over your thighs and keep your back straight while tucking your tailbone towards the floor. Once here, you can then take this to Revolved Chair by bringing hands to prayer and revolving the torso so your elbow is on outside of the knee. Keep your hips squared and focus on finding balance and ease with your breath. This pose helps stretch the shoulders, hip, and neck. On each inhale, lengthen through the sides of your torso, and as you exhale, twist and ground deeper into the pose. Bring attention to the space between your ribs, and imagine creating more space with each inhale as you lengthen. Gaining confidence in Crow pose is important not just because it's one of the best prep poses for Side Crow, but also because it's the start of many arm balances to come in your practice. To practice Crow pose, start in a low squat with palms on the mat and fingers spread. Keep your arms bent like in Chaturanga so you can use them as a shelf for your knees. Slowly lean forward as you place your knees as high as you can onto the arms, squeezing the knees into the arms. The key here is to lean forward to help with your balance as you lift your hips high while activating your core. It is also important AND helpful to have a drishti (gaze) point about 6 inches ahead so you do not topple over. Play with lifting one foot off the ground and then the other, with an end goal of drawing both feet up together towards your buttocks and straightening the arms. These are just a few of many poses that can help you gain strength and confidence as you work your way up to Side Crow. Many of these are challenging poses and can take time to work towards, so relax and trust the process. Breathe through any turbulence and fear; it is there where you learn most about yourself. Plant those palms and fly high, yogis!